N-n-n-no time, no time, no time! Hello, goodbye, I’m late, I’m late. 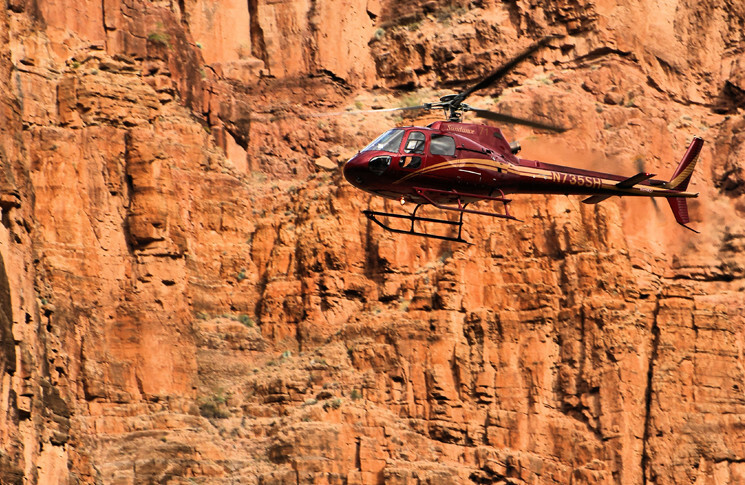 It was a touch of Hollywood and the highlight of the scenic flight: the rush of low flight over a high plateau, followed by a dive into the Grand Canyon, the same trajectory followed by a Ford Thunderbird at the end of the film Thelma and Louise. Inevitably, or so it seems with hindsight, one performance of the manoeuvre ended the same way as the film. The pilot and five passengers were killed and the remaining passenger seriously injured as a Eurocopter AS350-B2 helicopter collided with terrain after an uncontrolled descent. The US National Transportation Safety Board listed probable cause as the pilot’s decision to manoeuvre the helicopter aggressively at high-density altitude which ended up decreasing the aircraft’s ability to arrest a high rate of descent before ground impact. It is likely that the manoeuvre attempted became unrecoverable. How could this happen to a turbine helicopter from the same family of helicopters that set the world record for the highest landing in the world on Mt Everest less than one year later? The high plateau the helicopter was operating over immediately before the crash was 5300 ft with an outside air temperature (OAT) of 34 °C. At this density altitude (8700 ft) the aircraft would have only been able to maintain a hover out of ground effect with around 40 fpm rate of climb (the limitation is gas generator turbine rpm, Ng, which approaches its maximum allowable as the air becomes less dense). At the accident site on the western descending slopes of the plateau the elevation was 4080 ft and the helicopter was capable of an out-of-ground effect hover with approximately 400 fpm rate of climb. The aircraft investigation indicated that the aircraft engine was developing full power at the time of impact and the tail rotor pitch was at a high setting to counter the high main rotor torque. The investigation found that the pilot had previously shown tourists a Thelma and Louise manoeuvre where the helicopter flew low over the plateau diving over the cliff edge into a rapid descent. In other cases, the pilot had, as a joke, flown towards cliffs pretending not to notice as the passengers tried to tell the pilot of the approaching hazard. The investigation concluded that it was likely the pilot was conducting the Thelma and Louise manoeuvre and generated a high rate of descent over the cliff and down the slopes from the high plateau. At some point, this manoeuvre became unrecoverable. It is surprising and maybe counterintuitive that a helicopter could develop a manoeuvre that did not give the pilot sufficient time with the available power to arrest the rate of descent that had been generated. In this case, it is likely that the pilot continually flew more and more aggressive dives over subsequent flights until the point where the recovery was not commenced in time to avoid the inevitable impact with the ground. Let’s consider the aerodynamics behind this accident by looking at the power curve. The total power required by the helicopter is made up of rotor profile power, parasite power and induced power. Profile power is the power required to drive the rotors and accessories at operating RPM and zero main blade pitch. It is essentially constant until it increases at high speed due to increased tail rotor pitch required to counter torque and eventually compressibility on the advancing main blade. Parasite power is the power required to overcome the drag of the fuselage and anything else the main rotor pulls through the air. As airspeed increases it rapidly increases as the power is proportional to true airspeed cubed. Inflow increases due to forward tilt of the disc and the forward airspeed and this further increases parasite power. Induced power is the power required to produce rotor thrust and manifest itself as the power required to overcome rotor drag due to lift production. This power decreases with airspeed as the airflow over the disc reduces the amount of induced flow produced allowing the blade pitch to be lower and tilting the total reaction forward. This reduces rotor drag for a given lift. These three power requirements add together to give the power-required curve. There is a slight decrease in total power at zero airspeed if hovering close to the ground due to ground effect which again reduces induced flow. We can see that at low speed the power requirements are high due to high induced power and at high speed the power requirements are again high due to the parasite drag mainly but also some profile power. The power available is represented by a horizontal line and where this sits on the Y axis determines how much excess power there is. The excess power is the difference between the power available line and the power required curve. The excess power is used to hover or climb or produce a forward vector to overcome parasite drag. The accident occurred at high-density altitude and the engine power was reduced by the Ng limit. We also know that the aircraft was capable of generating about 400 fpm rate of climb at the accident site in a hover so the power available line must have been close to the power required curve. The accident report indicates that the aircraft was at high speed and so would have been operating at the right-hand end of the power curve. At this high speed the amount of excess power would have been reduced. 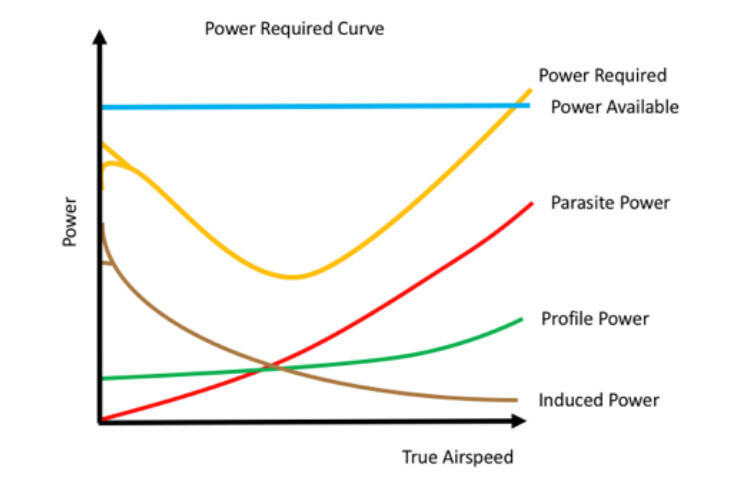 The other effect of the high-density altitude is to slightly shift the power required curve up and right due to the increase in induced power from the lower density air requiring a higher induced flow to maintain mass flow and an increase in profile power due to the higher true air speed. This would further decrease the excess power available. Helicopters can easily generate rates of descent well over 2000 fpm in a dive. Large rates of descent take time to arrest even at sea level. At high-density altitude with a reduced excess power margin this is going to take even more time. The world of fast jets has long dealt with diving manoeuvres and has several generic rules of thumb. For low G aircraft these include the 50 per cent or AGL/200 rule where the dive angle should not exceed half height AGL divided by one hundred. For example, at 1000 ft the maximum dive angle would be 5 degrees. Minimum safe altitudes or hard decks are common but do not always deal specifically with unplanned manoeuvres or unexpected errors. Often these guides are not based on aircraft performance or pilot reaction time but more what has been passed down as seeming to work. The actual limit for a specific aircraft on a specific day is often unknown. For every diving manoeuvre for any aircraft there will come a point where recovery is no longer possible due to a combination of atmospheric, aircraft performance and pilot reaction time. The US Air Force (USAF) conducted a review of ‘knock it off’ criteria for diving manoeuvres after an F-22 flight test accident. 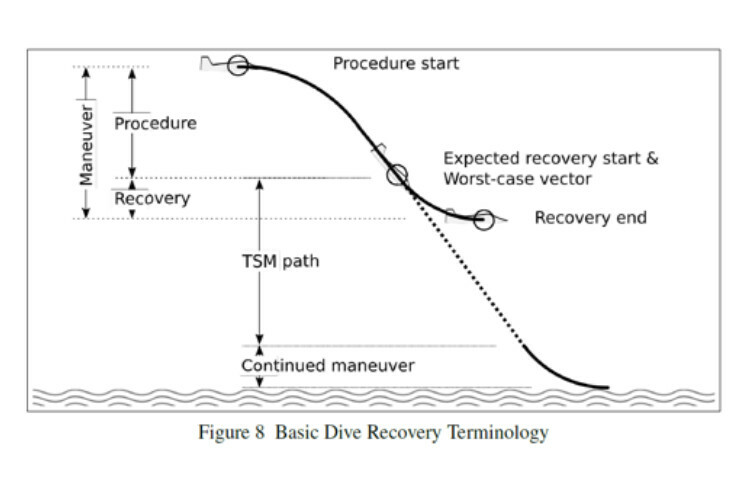 The review found that a better way to approach safety management in diving manoeuvres was to apply a time safety margin (TSM) before the point where the dive became unrecoverable. TSM aimed to provide a more rigorous method to determine sufficient recovery times for diving manoeuvres than just hard decks or recovery altitudes. A TSM of 2.5 to 4 seconds requires simulator work up and modelling to ensure appropriate safety. A TSM of 1.5 to 2.5 seconds requires a back-up source to cue recovery and requires immense amounts of training and practice, usually with a radio capable external observer. The risk is considered high. An F-22 test pilot can rely on the support of many engineers to help calculate TSM. As well, the performance of the F-22 is well known and can be plotted accurately. For this helicopter accident there was limited performance planning and external support available to the pilot. Helicopters at low level, manoeuvring aggressively, will very quickly get strong feedback from the ground cues right outside the pilot’s window. Increased rates of descent can be quickly detected when close to the ground, and promptly and almost subconsciously corrected by the pilot. The TSM in these cases is likely to be small, however, the pilot gets strong feedback and can react inside the TSM. In the accident pilot’s case, greater rates of descent were generated than would have been attempted during low-level flight. The steep dive over descending terrain would have put the aircraft a lot higher above the ground and the normal immediate feedback a low-flying helicopter pilot gets would not have been present. The accident pilot would have got to the point where the cues from the ground rush and closure were not available to indicate recovery was required until the TSM was less than the pilot’s reaction time. The TSM may have even been zero by the time the pilot realised recovery was required. It is worth considering how a recovery action from a dive might be different between a helicopter and a fixed wing aircraft. A fixed wing aircraft can rapidly increase its lift by changing its attitude and hence angle of attack on the wing. In a helicopter an attitude change, on a large scale, does not change the value of the total reaction vector of the rotor. The attitude change only alters the direction of the the total reaction rotor vector. Attitude change will provide some vector to decrease the rate of descent, however; the primary aim for recovery from a dive in a helicopter is to increase collective to maximum power as quickly as possible. This will increase the size of the total reaction and increase the amount of thrust countering the rate of descent more than altering the angle of the total reaction only. Raising the collective should not be delayed by a desire to raise the attitude. How much time is enough? Unfortunately, there isn’t a lot of performance data in most helicopter flight manuals to work this out precisely. Over varying terrain and changing manoeuvres, it is unlikely the helicopter pilot could determine a reliable TSM. The main lesson is power is not endless even in a turbine helicopter. You can run out of power if your manoeuvre is aggressive enough and you don’t give yourself enough time to identify a problem, react to the problem and then allow for the helicopter performance to modify the flight vector. 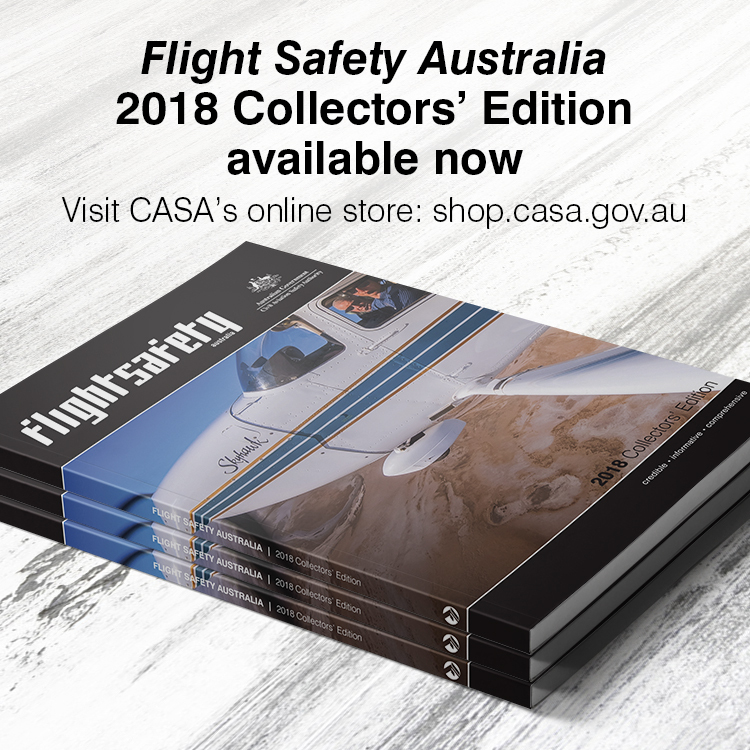 Use the minimum manoeuvres required for the task and ensure they are within the normal operating profiles as specified by the flight manual and company operations manual. A fatal accident is forever. The unknown quantity was how much time was enough to recover before impact. Lewis Carroll’s White Rabbit seemed to have a rough idea. This week’s aviation quiz will be our first on helicopter operations and its questions relate to this story. You may wish to re-read, ponder and study before attempting it on Friday.